The security of our home is a sensitive matter for most of us. When we’re away at work on vacation, we often find ourselves troubled worrying about whether our home is safe while we’re gone. Even if we go so far as to hire someone to watch our home, there’s still no way that we can keep a constant watch on it 24/7. And it’s these moments when no one’s looking that intruders specifically wait and watch for. Installing a residential security window film for your Kansas City home can help keep your loved ones and belongings safe while you’re away. Residential security film creates a tear resistant barrier for areas that are easily and common to break into, like windows and doors, effectively keeping intruders out. Several studies have been conducted on the habits of burglars. One thing that they almost always have in common is that they stake out a home first before breaking in. In fact, many go so far as to knock on the front door first before attempting entry. Once inside, they look for things they can grab quickly, including credit cards, cash, and jewelry. Windows and doors are the most common ways to break in. In fact, one study concluded that 34% of burglars enter through the front door while another 23% use a window and another 22% enter through the back door of the home. While many people worry about garages, this study suggested that garages are the least likely point of access, accounting for only 9% of break ins. Since doors and windows are the most commonly target areas for home breaks in, they need to be secured. While locks can keep someone from opening a window or door, they can’t stop them from smashing the glass. 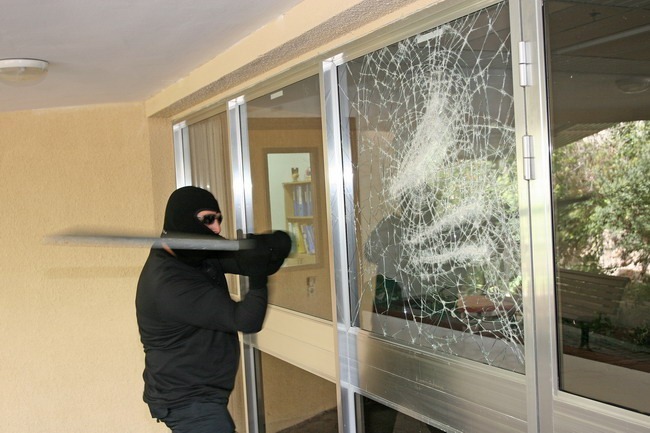 Installing a residential security window film can help protect your home from break ins because it increases the strength of glass window panes. With window film, glass becomes more flexible and difficult to break. Even if someone does somehow smash the glass, the film will still stay in place so that there’s no opening through which an intruder can get inside. Is your home protected from intruders? Let our team come and do a free home security consultation for you. Call us today to get a quote on security window film in Kansas City or schedule your appointment.